As WA’s Margaret River wine region celebrates its 50th anniversary, we celebrate the pioneers who brought it all to fruition. A hundred years ago, a couple of Italian immigrants arrived in the south west corner of Western Australia with some cuttings of a little-known grape variety called Fragola. These vines produced the first wines to be sold in Margaret River for the hefty price tag of two shillings a flagon. Fondly dubbed ‘red dynamite’ by the enthusiastic community, this wine was in high demand at the local dance halls where it was sold from the back of a truck. And it was said to pack quite a punch. 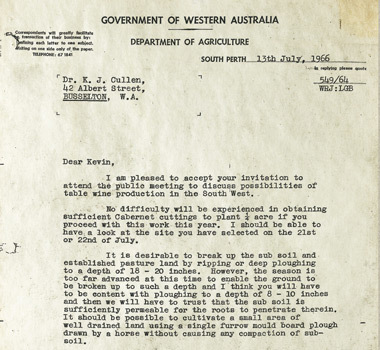 Times have certainly changed since then and while other growers produced small batches of wines in the ensuing years, it wasn’t until the mid 1960s when agronomist Dr John Gladstones published a report identifying Margaret River’s vast potential for viticulture, that the region, as we know it today, was born. The Gladstones report attracted the attention of budding vignerons and medical practitioners, Thomas Cullity and Kevin and Diana Cullen. In mid 1966, the Cullens organised a meeting in the Margaret River township of Busselton inviting Dr Gladstones to speak. It was the final push those attending needed. Soon after, the Cullens, in partnership with Tom Cullity, and Geoff and Sue Juniper, planted vines in Wilyabrup, which unfortunately didn’t survive. 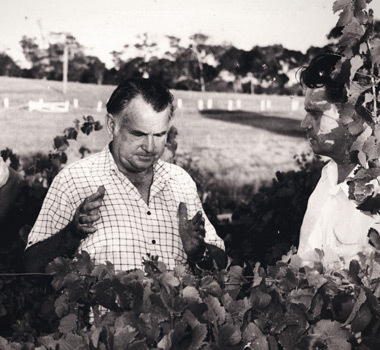 It was left to Cullity, who in 1967 purchased a mere eight acres of land, to plant Margaret River’s first commercial vines – Cabernet Sauvignon, Shiraz, Malbec and Riesling. He named his venture after French sailor, Thomas Vasse, who had drowned in Geographe Bay. Hoping for better fortunes than the Frenchman, he added the Latin word for happiness – Felix. His first crop, too, was all but a disaster, decimated by birds and succumbing to bunch rot. Undeterred, but determined, Cullity persevered. 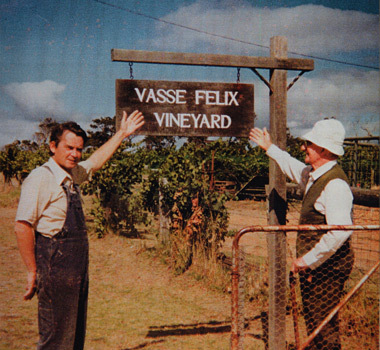 In 1972, Vasse Felix won a gold medal at the Perth Show for its Riesling. The following year, gold for its Cabernet. Happy days, indeed. The Cullens also persevered. In 1971 they planted vines on their own land where their current vineyard still thrives. At this stage, Moss Wood had been established for two years and within another two years, Cape Mentelle, Leeuwin Estate, and Woodlands had also been established. In what was a fledgling industry at the time, these founding wineries worked tirelessly to forge the region’s reputation as a premium wine producer. “I pay tribute to the winemakers and grape growers of Margaret River,” says Dr Gladstones, who is still a proud member of the Margaret River community today. While the pioneering wineries may have simply dreamed of making good wine, there was a certain Californian who knew of Margaret River’s enormous potential – Napa Valley wine baron, Robert Mondavi. 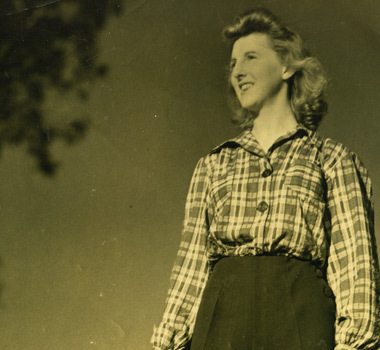 As the story goes, Mondavi was searching the globe for the next great wine region. His search took him to Margaret River and a patch of land owned by Denis Horgan, a chartered accountant, and his wife Tricia. Today, it is Leeuwin Estate. Mondavi’s advice was also greatly accepted by Cullity and Kevin Cullen, who Denis befriended and met up with regularly to discuss all things wine. “You would have sworn you were in a dog fight,” Denis says of the trio’s rendezvous. “They used to swear and curse and talk about one another’s wines, and then we’d all sit down and have lunch like we were the greatest of friends. Fifty years on, Margaret River is indeed a world class wine region. While it only produces three percent of Australia’s wine, it contributes 20 per cent of our premium wine production. It is recognised internationally for exceptional Cabernets and Chardonnays, and also produces a stylish signature blend of Sauvignon Blanc and Semillon. The handful of wineries have now boomed to over 200 with most of them producing the flagships, while also experimenting with other varietals and blends that suit the Mediterranean climate, cooling sea breezes and rich gravelly soils. In the northern districts lies the family-owned Credaro Wines, where some of the region’s first vines were planted by the pioneering Meleri and Credaro families to produce the ‘red dynamite’. These days, they have over 140 hectares of vines spread across five vineyards and alongside the legendary Fragola, and Chardonnay, Cabernet and SBS, they are doing well with Pinot Grigio, Shiraz and Merlot. Thompson Estate is renowned for its Chardonnays and Cabernets, but is also finding favour with its Cabernet Merlot, Malbec and famed Four Chambers Shiraz. The 20-year-old vines are organically grown and produce impressive wines under the watchful eye of Bob Cartwright of Leeuwin Estate acclaim. At Hay Shed Hill, whose vineyards were first planted in the 1970s, the Block 6 Chardonnay is the star. Dry grown and located on a steep south facing slope, it is lean, light and fresh, but also has “flavour, aroma, body and textural interest,” says winemaker and owner, Michael Kerrigan. In concert with the Block 6, he is also giving plenty of attention to a stunning Cabernet Franc, as well as an intoxicating Shiraz Tempranillo blend. In the cooler, southern parts of the Margaret River, Sauvignon Blanc really finds voice as a single varietal. In close proximity to the Indian Ocean, you will find Redgate Wines, a winery that takes its name from a nearby property that once had a prominent red gate and was known for the production of a rather powerful moonshine. This estate, established by the Ullinger family in 1977, produces a sublime Sauvignon Blanc that is layered with gooseberry and lime. Their Cabernet blends are also beguiling, and they have a Chenin Blanc that is also turning heads. Even further south lies Hamelin Bay Wines, a quaint winery with a simply breathtaking outlook. It produces one of the region’s finest Sauvignon Blancs – fresh, vibrant and tropical, while their Rampant Red, a blend of Shiraz, Merlot and Cabernet, is winning fans. When Moss Wood winery was sub-divided in 1982, architect Bruce Tomlinson purchased the land and established Lenton Brae winery. Putting his talents to use, he built a striking rammed earth winery and cellar door with two towers that are home to quintet bells from Westminster and chime on the quarter-hour. A few years ago, the Tomlinsons introduced a new varietal to the region, Pinot Blanc. This unassuming grape is a mutation of Pinot Noir, yet genetically similar to Chardonnay. Winemaker, Edward Tomlinson, says he was drawn to the subtle charm of this early ripening variety. And these are not the only newcomers to the region. There’s been an influx of plantings of Mediterranean varietals in recent years, with Fiano, Vermentino, Nebbiolo and Sangiovese finding favour amongst the growing band of winemakers. As the 50th celebrations kick off in earnest, it is heartwarming to see much love given to the traditions of the pioneers. Vasse Felix’s ‘tractor bucket’ party recreated the spirit of founding producers who celebrated each of those crucial early vintages in style with tractor buckets turned into eskys, filled with ice and wine and enjoyed out amongst the vines, even serving as a bed on some occasions. “Anniversaries such as this are an opportunity to share with the world just how special Margaret River is. It is a wine paradise,” says current Vasse Felix owner, Paul Holmes a Court. The single remaining bottle of the 1972 Cabernet Sauvignon Malbec is on display in the Vasse Felix vault and to celebrate the winery’s 50th anniversary, they have released a Tom Cullity Cabernet Sauvignon Malbec made from those original vines. I am sure the good doctor would approve. And while he would be astounded to see how big the region has grown, he always knew how good the wines were going to be. The best is still yet to come says Dr Gladstones, who fittingly gets to have the last word. “I strongly believe that we’ve only seen the beginning,” he says. “This region has tremendous natural advantages for grape growing to produce top quality wines. Like most producers in the world, Italian wineries are constantly looking at making better quality wine. In Italy in recent times, this search has become a study of the ‘fashion of form’ – uncovering the intricate concept of structure of wine to help conceive that perfect drop. This thinking has also extended to ‘Turismo Enogastronomico’ (food and wine tourism) with spectacular results. Old estates have been transformed by a collection of famous Italian architects, so that the cellar door and winery has become as much the centre of attraction as the wine. It is a union between tradition and modernity, a road map that directs guests and the curious to an unexpected and beguiling journey. These new concept wineries have been designed by architects and engineers in conjunction with Italy’s most famous contemporary sculptors, and using biodynamic principles so their designs are at one with their environment. Gone are the boring rusty tinned walls of decaying estates, ushering in is a new era of engineering that utilises the natural shape of the landscape as the centre of attraction. Buildings don’t just go up, they also flow out, around and even down inside the earth. Natural inspirations The choice of materials, most of the made from recycled or sustainable products, and the sensitivity for the surroundings have been critical elements in this architectural revolution. The most precious inspiration for Arnaldo Pomodoro, one of Italy’s greatest contemporary sculptors and designers, was a turtle, a symbol of longevity and stability. In this case, the shell of the turtle became the domed copper roof of the Tenuta Coltibuono di Bevagna , a winery in Umbria. Pomodoro had produced many sculptures in his time, but this was the first for the wine industry and the success of the project reverberated on an international scale and set the tone for the design wave to come in the Italian wine industry. Other wineries followed suit, embracing the art of the concept and seeing it as a way to reinvigorate tourism to the wine regions. Designers and architects Paolo Dellapiana and Francesco Bermond des Ambrois collaborated to conceptualise the Cascina Adelaide di Barolo in Cuneo, Piemonte. This amazing structure has been built into the hills, and from a distance it almost disappears into the countryside, perfectly camouflaged with the rest of the habitat – almost like a Hobbit house full of wine, if you will. Structure and form While many of the structures are dazzling from the outside, just as much thought and design has been applied to the internal workings. Everything from barrel halls to crushing rooms have transformed wineries’ inner workings into virtual exhibition halls. The new Antinori Cellar Door in the Chianti Classico area near Florence is a perfect example. Designed by Mario Casamonti it is a truly unique structure. With a surface area of 24,000m2, it took eight years to construct, with an investment of 40 million Euro. The structure is developed horizontally rather than vertically, with the winery hidden in the earth. The production facilities and storage are spread across three stunning levels. And the interior design is simply breathtaking with terracotta vaults to ensure perfect temperature and humidity levels. The new world order Where Italy once had wineries they now have monuments. And while there are still plenty of the old style ‘casale’ with moulded walls and giant dirty barrels, the way forward is for large, clean, bright and spacious structures with areas dedicated to each individual phase of wine production. This concept of wine and design seems to be resonating around the globe with architects working on amazing structures from California to Chile, from Spain to France, from Alto Adige to Sicily, and even right here in Australia – think Chester Osborn’s big Rubik’s Cube plans for d’Arenberg in McLaren Vale. The future is now and it is an exciting time for those who appreciate design in architecture and in their wine glass. Get to know the ladies behind Claymore Wines -General Manager Carissa Major and Winemaker, Marnie Roberts Carrisa, you say you “had the good fortune to fall into” the wine industry days after your 18 th birthday – what’s the story behind that good fortune? As in real estate – location location location! I grew up at the southern end of the Clare Valley, had travelled throughout my 17 th year (thanks to the possibly misguided generosity of my parents) then landed back into the Clare Valley …a little bit jobless and without a sense of purpose. The idea of university for uni’s sake was less than appealing so my one year gap turned into two and through friends of the family I wound up with a position at Knappstein Wines Cellar Door. Tim was still on site then and I found the whole staff tastings both inspirational and intimidating but got enough out of them to want to learn more. Andrew Hardy had a similar approach to staff engagement so what started off as a spark became something a little more…so basically, I had the right door open at the right time. Got sucked in and found this amazing industry that brings people together while opening up the world. Given the quirky nature of the brand, do you have to bring out your inner quirks too? Well it’s not hard really…they are never too far from the surface! The best thing about the brand is that link to music informs so much of the fun every day and provides a motivating backdrop to the workplace. There is nothing better than an impromptu Friday afternoon singalong with customers as Meatloaf cranks out of the sound system (and yes that really did and does happen!) Are you a Voodoo Child, or do you like a splash of Purple Rain, or do you hear London calling? (i.e. what’s your favourite Claymore wine and does your love of the wine match your fondness for its namesake?) Oh there are too many to choose from; from a wine perspective though I do have a soft spot for London Calling. It took a few years to win the boss over to Malbec – he’s more of a Merlot kind of guy – but it just shines in Clare and paired with cabernet it makes for such approachable drinking without compromising depth and intensity. One day I may be able to release that straight Malbec…not sure what label I’d choose though. Can you recall the first wine you tried? Easy one – we grew up farming on the outskirts of Auburn in the shadow of Taylors wines so it was their white wines that graced our family table for special occasions. From the age of about 12 I was allowed a half pour if their amazingly bone dry, fully worked Chardonnay which I would duly sip over the course of a meal. It was dry, acid and complex for my junior palate and I recall grimacing after the first taste but would never dare leave a drop…it was wayyyy too special! What do you think is special about your wine region? There is an easy intimacy to the Clare Valley that you don’t see in many other regions; intimate without being aloof or removed. From a wine perspective there is an underlying elegance to the wines we produce here – even those 15.8% brooding monsters carry an underpinning structure that balances that intensity. Any region that can pull off our delicately structured Rieslings that defy expectation with just how powerful they can be and at the same time produce complex, finely drawn cabernet and nuanced yet flavour busting shiraz has to be special. It’s a multi-faceted little dynamo that continues to surprise and delight..and the locals aren’t a bad lot either! Do you have a favourite holiday destination/memory? We spent many early years holidaying at Elliston on the West Coast in the family shack – total beachfront, tumble down tiny fibro thing that we’d have to drive seemingly endless distances to get to while listening to the Australia Open on the radio (?). Fishing off the beach and jetty, grandma’s garfish and squid for breakfast pan fried in truckloads of butter and playing tennis on asphalt courts then jumping into the ocean to cool off. Oh – nostalgia overload! Now I like to recreate that sense of simple pleasure and we still holiday in shacks (just closer to home on the Yorke Peninsula) and chase fish and squid from the jetty and beach while fossicking in rockpools, building sandcastles and eating hot chips. Except now I chase it all down with a Riesling or two – best ever with fresh shucked oysters! And Marnie, as Claymore Wines winemaker do you have to make the wines to match the songs? Or does lyrical inspiration come after the tasting? The link of wines and songs seems to naturally evolve. The base constant is always to create the best wine to start with and I suppose, yes, doesn’t everyone get inspired in some way when they are drinking wine?! Certain labels do make complete sense to me. Nirvana is a Reserve Shiraz and drinking it you hope to reach a state of Nirvana. Dark Side of the Moon is our Clare Shiraz and it has the elegance and dark seductive fruit layered over oak. Do you get to name any of the wines? We all have input and suggestions which can be quite amusing. I got Skinny Love across the line which came to me in the car while singing it at the top of my lungs….the Claymore version of 'Car Pool Karaoke'. Was it your dream of being a rock star that drew you to Claymore? The Rockstar dream is still my back up occupation if the winemaking thing falls through. So far, the music world is safe. I do love the idea of the music and wine. I think to make good wine you have to have an element of love for the arts and the creation of things. Wine and Music just make sense - both are so evocative and amazing for setting a sense of place and time. All those great moments, you know the BIG celebrations in life can usually be tracked back in the memory banks tied to a particular wine or song! What is your favourite wine to make? I don’t think I could pick a variety or a style as such. I love the process and the chance to follow it the whole way through. From the vineyard basics of pruning and harvesting to ferment to batching to oak to tank to bottle to mouth….it’s an amazing journey that I get to guide these babies through. When did you fall in love with wine? Growing up on a block in Mildura that went from citrus to dried fruit to winegrapes, I have always had an appreciation for the fruit. The love of wine was the next step. I remember the cask wine in my parents’ fridge in the 80s and then the big purchases of wine in a bottle. I remember one night, when I was around 19 or 20, going to a friend’s house who was studying to be a winemaker and he opened a 1994 Lindemans Pyrus. A wine from Coonawarra that is a Cabernet Sauvignon /Merlot and Malbec blend. IT WAS MASSIVE and I thought wow, I need to try more wines. It really blew my socks off as I hadn’t tried anything as big and succulent as that before. Can you cook? If so, what is your ‘signature dish’? I love to cook. With a toddler and husband that works away, time is limited but when I can, I love to invite friends around and cook. Homemade pasta with a trio of different sauce options is always a winner. The other is a stuffed squid. A recipe I have had for about 20 years and it never seems to fail. What do you do to relax away from the winery? I love to chill at home but my favourite getaways are anywhere near the water. I love the beach in winter and the river in summer. Anytime with my family is a bonus and I have great friends who are around for a catch up…which usually includes wine and food! Riverland producer Delinquente Wine Co. has taken label art in an even more contemporary direction channelling a punk ethos on their wines such as The Bullet Dodger Montepulciano and the Screaming Betty Vermentino. “The starting point with the artwork for Delinquente was to do something very different to traditional wine labels, but also to represent things we have a passion for, like street art and alternative culture,’ says winemaker/owner Con-Greg Grigoriou. “The art represents our ideas and allows us to connect with people in an interesting way. We all know a ‘Screaming Betty’, or would at least like to party with her. So they have taken on a life of their own.” Not everyone is a fan. Seventy-nine-year-old wine critic James Halliday described Delinquente Wines as setting “the new low water-mark” for labels in Australia. But he likes their wines. And that’s the thing, the wine has to be good to get the buyer to keep coming back. These days, wine is fashion and bottle shop aisles are the catwalks. Marketing a label is just as important as the wine inside the bottle. Get both right and you could just make it. Traditionalists will most likely continue to stock their cellars with family crested bottles. The millennials crave new and exciting. As for me, I’ll see you on the dark side of the moon.